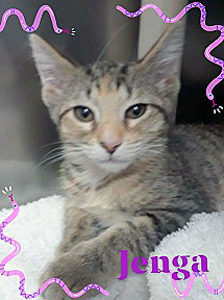 Jenga and her sister were rescued in Queen Village when only 4 weeks old. JENGA has an incredible temperament. She relaxes and goes limp when you hold her, because she trusts you so much. She has been Miss Congeniality when scout & school groups tour our Wantagh cat adoption center. Now she’s at PetSmart, Huntington, entertaining the volunteers there while she eagerly awaits the arrival of the Special Person who will adopt her into a loving Forever Home. This entry was posted in Adopted, Adopted Cats, Female, Under 6 Months. Bookmark the permalink.